I didn't know camels were native to WA! 1:53 I knew where that photo was taken as soon as it came up. Wolf, they're not native to Australia but were brought here, if I've got it correct, to help with discovering our vast country by explorers. Now they need culling because there are too many of them in the wild. 1:41. Good Morning Wolf, Anne and all! Guess I'll stay inside today! Shosho got to do her own happy dance! 34 comments 4 days in a row! I'm more spooked out about you NOTICING that, Beehive! Continuing to learn new things everyday - camels in Australia - yep, that's surely new info! Hello to all the previous visitors & cheers to those arriving later -have a Good Day! We just finished shoveling our overnight Nor'easter snow dump - wet, heavy, getting heavier as the temps rise - umph! Morning all,there are camel rides available at the beach near us too. 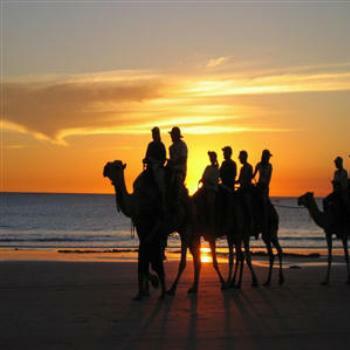 Camel rides in Australia! Interesting! Wendy. POOZLE POOZLE POOZLE POOZLE POOZLE. First of all I should say that despite making the trip south Snowbird posted a correct result to last week's poozle. There's devotion for you. Australian export camels to Saudi Arabia too. There are camel races in Alice Springs and Australia camels race in Saudi Arabia.